Orcas are the largest member of the dolphin’s family. Newborns are 2.1-2.6m in length and about 160-180kg in weight. Adult females are up to 8.5m long and 7.5tonnes in weight; adult males are up to 9.8m and nearly 10tonnes. There are 10-14 pairs of large, slightly recurved teeth in each half of both jaws. These are extremely long lived animals, with males living up to 60years and females up to 90years. Orcas have robust bodies, with unique black and white colouration pattern. The lower jaw, ventral side of the flukes, and abdomens up to the urogenital area are white. White lobes extend to the sides behind the dorsal fin, and there is a white oval patch above and behind each eye. The rest of the body is black, except for a light-grey saddle patch behind the dorsal fin. The boundaries between black and white are very distinctive and sharp. The tall, high dorsal fin is almost as distinctive as the colour pattern. It may reach 0.9m high in females and 2m in males. The dorsal fins of females and young are falcate, and are generally pointed or rounded at the tip. Adult males tend to have dorsal fins that are triangular. The pectoral flippers are large and paddle shaped. Orcas have rounded snouts with very poorly defined beaks. Though best known for their habit of preying on other marine mammals, orcas often eat various species of fish and cephalopods. They can also occasionally eat sea birds and sea turtles. They often use cooperative techniques and great diversity of feeding strategies to obtain food. Some populations are known to show dietary specializations on particular types of prey. 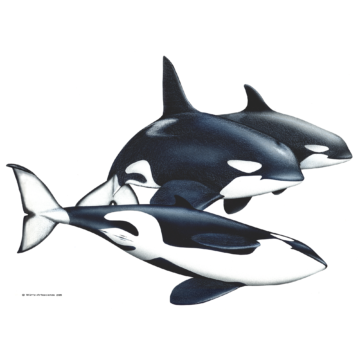 Some pods of orcas represent one of the most stable societies known, individuals stay in their maternal group throughout life. 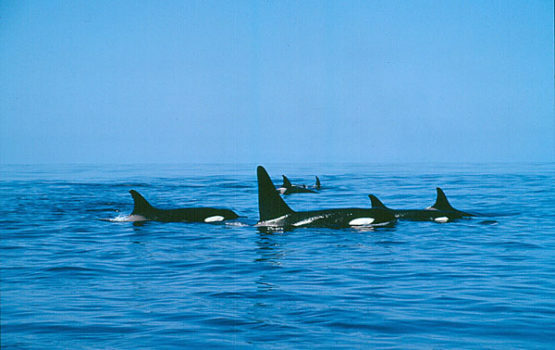 Resident orcas usually live in larger groups (up to 55 individuals), while transient orcas seem to form smaller families (up to 10 individuals). Calving can occur year round, after a gestation period of 15-18 months. Calving interval can be up to five years. Their behaviour is fascinating, although they don’t usually bow ride waves of vessels, they are known to breach, spyhop, flipper-slap and tail slap, and when performing a steep dive they can even raise their flukes. This species of dolphins is definitely the most cosmopolitan of all cetaceans, observed from the equator to the ice edges in both hemispheres, occurring in coastal and offshore waters. 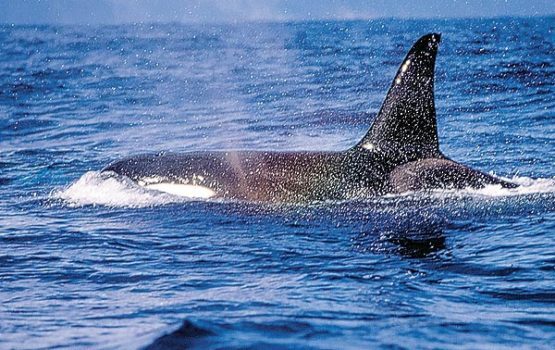 Due to their unique coloration and large size it’s unlike to confuse orcas with any other species. 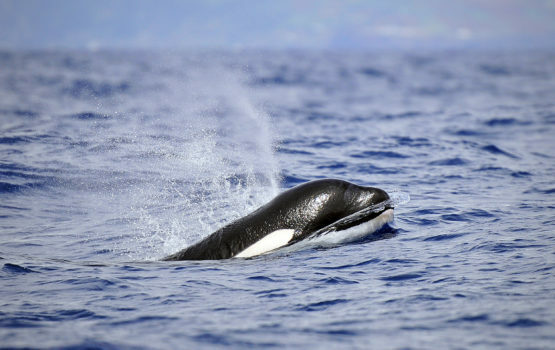 Orcas are a rare cetacean in the Azores. Sightings can vary between 0-3 times per year, and have occurred between April and August.